Can You Really Make Money With The Decluttr App? Have some stuff (CDs, games, DVDs, etc.) laying around that you would rather sell? If so, then this app might be an answer to the problem! But can you really make money with the Decluttr App? We decided to take a look at it and see if it was everything we heard it was. 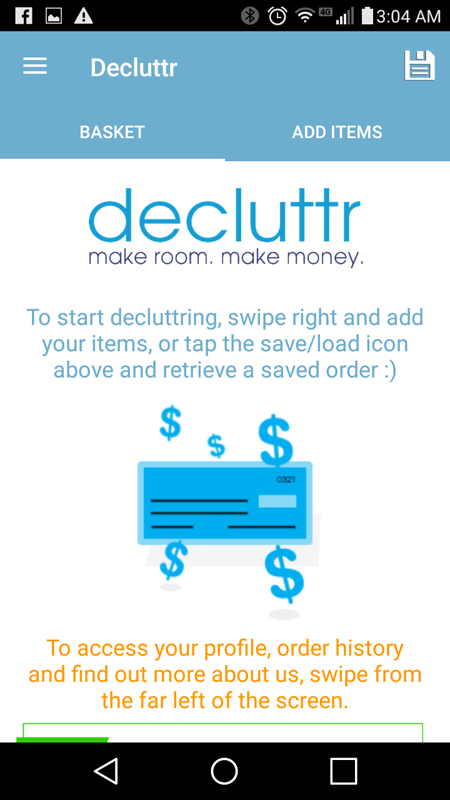 I love the idea of decluttering, and I’m also a big fan of getting paid for stuff that I don’t use anymore—so naturally, this app appealed to me right from the get-go. But I was also a bit skeptical, because it almost seemed too easy. Could I really make enough money with Decluttr to justify the act of sending my movies, games, and CDs off to this company? You can try Decluttr for yourself here. Personally? I've found that the hours I spent trying to sell stuff through apps wasn't worth the time. I could make $5 here and there, but it wasn't a reliable income. Instead, I dedicated a few hour per day to doing this and I was able to quit my job after 18 months. I haven't been back for almost 10 years now! 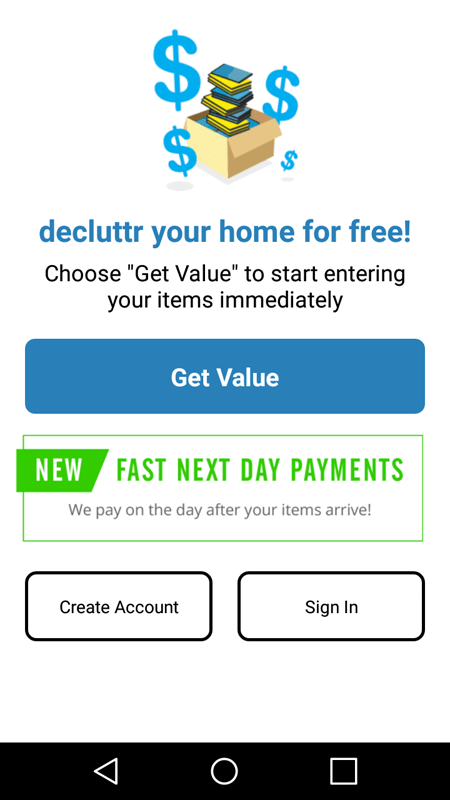 Decluttr is an app that you can use to sell your unused, unwanted DVDs, games, and/or CDs. The process seems pretty simple, according to the Google Play Store. 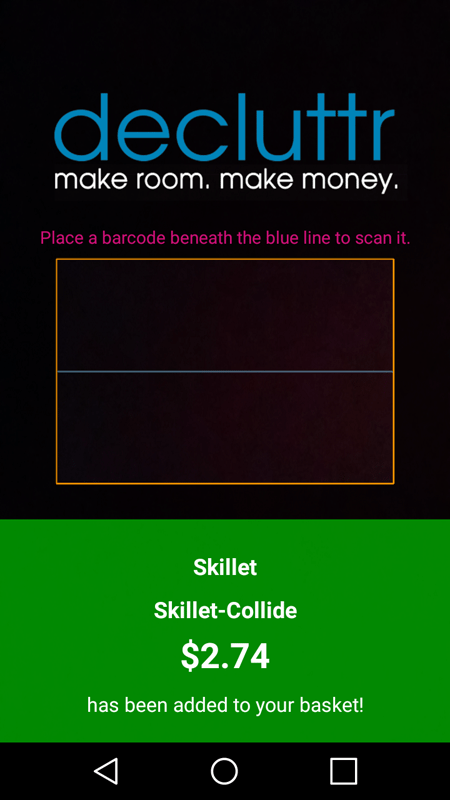 You simply scan the barcode of the item, and then check the app to see how much cash you could get for it. You then build a basket, send in your items, and get paid. But we decided to go in-depth to see exactly how profitable the app could really be. So we downloaded it. And here’s what we found out. First of all, we learned that over 100,000 people have downloaded it. At first I was a bit disappointed by the somewhat smaller download audience—but after figuring out exactly what this company did, I realized that, in theory at least, the smaller the download audience, the greater the value you could get for DVDs, games, and CDs…. right? The app has 3.8 stars on the Google Play Store, which is pretty good. Next we opened up the app to take a look inside. This was the first screen that we came to. It seemed to be a page with some basic instructions for how to use the app. Once I got started looking around the menu, I came to a screen with the Decluttr logo that told me to swipe. I did, and was taken to this screen. This seemed to be the sign-in/create account screen, though I didn’t actually have to create an account to start entering in items. There was a button that said ‘Get Value,’ which I could apparently use to start entering items immediately. I decided to try this feature just to see what kind of money I could get from items that I had laying around the house. After all, the idea behind this review was to see if I could really make any money with the app—and this was a step in the right direction. Clicking on the ‘Get Value’ button brought me right back to the hub where I started—which was fine with me. I swiped left to ‘Add Items,’ and got started. The screen that came up next had a nice barcode scanner in the middle of it. All I had to do to get a good scan was to hold it over a barcode until it beeped. I decided to try the app out on a DVD, a CD, and a game, just to see what I could get for each. First, I scanned an old copy of my Skillet CD, Collide. This CD was worth about $15 new when I bought it back in 2005. The app said that I could get $2.74 for it. 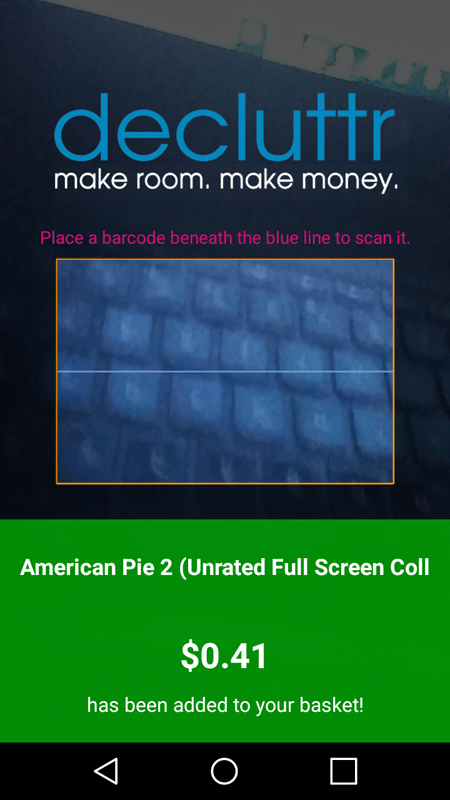 Next, I scanned my copy of American Pie 2, the Unrated Version. I paid $5 for this bad-boy in a sale bin at Wal-Mart about 4 years ago! The app told me that I could get $0.41 for it today. And last, but certainly not least, I scanned my Lords of the Fallen Xbox One video game that I bought second-hand a year ago at GameStop for $18.00. The app told me that I could sell this one for $0.42! At this point, I felt like I had a pretty good idea about what I was going to get out of the average game, CD, and DVD in any given collection. Granted, there are going to be some variables in selling price for different products—but in-general, I just have to say that I found these prices to be rather low. But that didn’t surprise me. I was a bit surprised that the video game wouldn’t have sold for more, but DVDs honestly aren’t worth that much nowadays unless they are collector’s items, and CDs are pretty much in the same boat. These prices aren’t going to get you rich. But, the app does make it really easy to send them in, because they will literally give you shipping labels and everything when you process the ‘order’ in your basket. This, by default, makes the app a better choice than sending your used products to the thrift store just to get them out of the way. It also beats throwing them in the garbage. I mean, extra money is extra money, right? And I have no doubt that anyone in the store who owned an Xbox One would go for it—just because these games are not cheap to buy—even used. But, on the other hand, some people don’t have access to these types of opportunities to sell stuff. Also, the time commitment requirements involved in selling large volumes of CDs, games, or DVDs this way just might not be worth it. For some people, getting a few extra dollars out of these types of belongings just isn’t worth the time it would take—which is the type of situation where this app would shine. It’s a sure thing that will get you some cash (or change, in most cases) for little to no work on your part. Will pawn shops pay more? Maybe. Probably. Does that mean that Decluttr isn’t worth using? Not necessarily. The app works really well. Selling your used CDs, DVDs, and video games with it is easy, and getting paid for them really isn’t difficult. Get your own account here! But you aren’t going to get much money. That’s really up to you. How much is your time worth? How much are your items worth? I’ll be honest—you will get paid more anywhere else, such as by selling your stuff locally on LetGo or OfferUp. Decluttr simply doesn’t pay much. But it will help you to get rid of your stuff, and it will get you paid for it. But be ready to make just $0.05 on some movies—because the prices can literally be that low. I really like the idea of Decluttr, and under certain circumstances, I might even use it. But as it is now, with these items that I scanned, I would probably just take my chances with Facebook to see if I could get a hit worth anything. If I sold all three items for $3 and got someone to come pick them up, I would be money and time ahead—and the video game alone is really worth at least $5 by itself—so even then, I would be getting a bit of a rip-off that still beat the prices offered by Decluttr. The app has a lot of positive reviews, and it can be awesome for helping you to move massive numbers of DVDs and the like—but it will probably only sit well with you if you literally don’t care about making money. 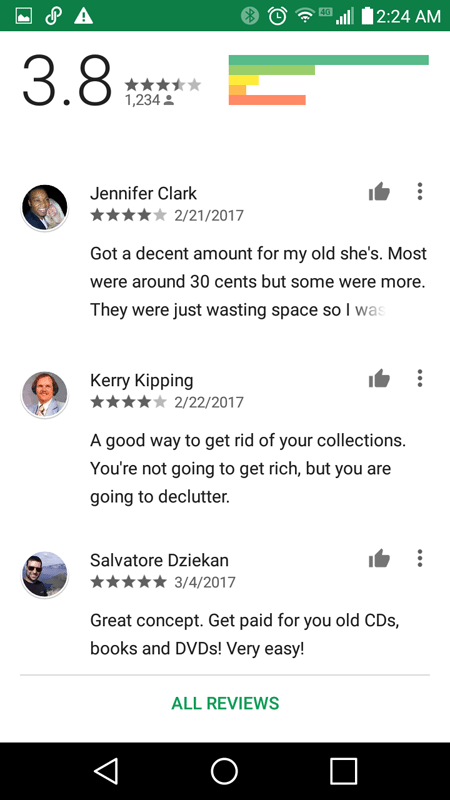 As a money-making app, Decluttr simply isn’t worth it, in my opinion. With Decluttr, you eventually run out of stuff to sell! It's a very limited way to make money online, but what if you could sell other people's stuff and make money too? What if you had access to a vast network of people that would pay you a commission each time you sold one of their items? This network exists! With affiliate marketing, you get paid a commission each time you sell a product online. I've been doing this online for almost 10 years now and it works great because I can choose from hundreds of thousands of online products to sell on my website. Pick your topic and learn how to build your website here! Decluttr might be a legit website but they’re a scam. I sent in a combination of 24 Blu-Rays and audio cds after having the site recommended by a colleague. Estimated $40 total trade in value. When they finally paid out my trade in (weeks later via Paypal, don’t believe their ‘fast payment’ hype), they only paid out $25. The e-mail I received said to check my order page for more details and the order page on my account said a third of my invoice was “not sent”, which is an outright lie. More suspiciously, all 8 of the items claimed as not sent were the most valuable of all my trades. They outright stole a third of my trade in and only paid for the cheapest two-thirds of the shipment. Support won’t do a damn thing about it as they simply repeat what’s been ‘entered in their system’. Either some employee at Decluttr made off with free stuff or Decluttr is going to turn around and sell those items at 100% profit for themselves. Stay far, far away from Decluttr. Heard about decuttr from The Penny Hoarder, and downloaded the app right away since I have a whole bunch of music and video games I have since replaced or already saved to my computer/phone.. Tried using it, and nope, doesn’t work. Nothing will scan, website doesn’t load, their support page is completely blank when I try to load it on my phone, and I’m pretty sure they phish info (credit card info etc, I’m having a very hard time believing that they WOULDN’T do this, am very sure they would charge for the return label). Uninstalling it now, oh well. Just say no to decluttr. Just have a good ol’ fashioned yard sale instead. Or go to a pawn shop or a flea market and sell your stuff there. I ordered a Pixel XL – Decluttr sent a Pixel. FYI, I recently used Declutter to clear out some CDs, DVDs and books. I was quoted about $23.00 for about 40 items. I shipped my box off and received an email saying my order was received , their quality control dept was reviewing the items and I would be paid in 3 business days. That was August 25th and I still have not received any payment. I emailed then this morning. Please cross fingers that I hear back. I’m not feeling a whole lot of confidence about this company. It is too bad, because I was so excited about the ease of use. If you take a look at the reviews before you download the app you will get a better understanding of how terrible this company is. They quote you one price and then after sending your items in, change the quote by up to half of more. They also change quoted prices on DVDs. This company is a rip off. I suggest selling your items elsewhere and not wasting your time with a company as shady as Decluttr. It’s sad the authors don’t really follow through to see if this is a good app with a reputable company. This company has an “F” rating with the BBB for not paying out what they say they would and for not paying at all, claiming items were never received or were damaged. What about that? Anyone of us couldn’t written the info above by just checking out the app – I feel this article falls short for actually clarifying IF we can really make any money with this app or if the company is a big scam like the complaints on the BBB site! How does one over look that info? Not a comprehensive article for me. Thank you for adding this research! I looked at whether or not it was possible to make money with it, but failed to mention their BBB rating. I’ll add this to my list of tasks to do 🙂 I apprecaite your candor and helpfulness. However, keep in mind that the BBB itself is kind of a scam. Companies are required to PAY to refute comments, and can get them removed or marked as “solved” to increase their rating. Sometimes, customers can add alternative names for the same business, and create multiple listings. Plus, the BBB attracts disgruntled customers in general. While it’s important to take their rating in mind, they are not the “only” way to to see if a company pays out or is legit. For example, the listing here says it’s not accredited (not paying BBB), and there are only 5 complaints. Decluttr hasn’t taken the time to respond to all complaints, so they get an F. They did respond to one though, saying that the customer was missing products they claimed were included. Another customer said that their phone was not accepted because of damage not mentioned when the product was sold. It’s not as cut and dry as you make it sound. HI they have an A Rating! Is there a way to tell is this app and apps like it are safe to use? The post reveals nothing about how the app protects your privacy. is there any information available about the platforms used for payment? Is it PayPal based? I ask because apps like this kinda squick me out a little. With all the fun and interesting ways to get scammed I weary of putting too much personal and payment information out in the world. Great review, I have seen this app before and have thought about downloading it myself, but I have always wondered if you could really earn decent money. Your review has more than answered that question. I am starting to believe there just isn’t really any apps out there that will make you enough money to really make it worth your while. Best of luck with everything and again really good job. I have never heard of this declutter app, so I am glad that I came across your post. This does sound very interesting and it makes good sense to recycle, reduce and declutter things that you no longer want. I will have to give it a try and perhaps pick up some extra cash. I will let you know my outcome. Man this sounds like a great concept for an app. I’ve actually been thinking about how I have many things i’ve been wanting to get rid of and this might be a great opportunity to do so. Thanks for getting the word out there. Also, I’ve read many of your articles and gotten great advice. Keep up the good work. This Decluttr App sounds like a pretty interesting concept. Instead of throwing away stuff you’ll try to sell it to someone who actually needs or wants it. If you can take it as a hobby or a way to do spring cleaning, then this app is great. Making you a little money along the way. I might just try this app. It’s pretty hard to imagine an app that will allow you to download and make good money from doing essentially nothing. Making money requires work! But I’ll continue the search and see what I discover. The decluttr app is a pretty good idea if you want to get rid of your stuff quickly and effortlessly and, well quite frankly for next to nothing. For the prices given for some items being ridiculously low why not just go wack them in a box and give them away to a local charity shop and get back some karma for helping out a local charity? ….with decluttr app you are practically giving away your stuff anyway so why not do the good thing and give them away to that charity shop that you have always walked past? Yes, it would probably be easier to just give them away, but I guess some people have a lot of junk. For me and you, who are travelers and tend to be minimalist, it doesn’t make sense to sell a CD for $0.75. It’s not worth the effort. But if you have 100 CDs you are getting rid of and converting your collection to all digital, then an extra $75 would be worth the effort! But then again, if you give it away to Charity, like the Goodwill here in the US, it’s a tax write off! There are so many apps of this nature out now that it can be really trying to test out each and every one! Thank you for such a thorough and honest review. I appreciate the fact that you were real about the fact that you could probably make more money elsewhere. Thanks for not sugar coating anything and shooting straight! I especially enjoyed your recent blog about the Decluttr App. This is an interesting concept. I’m always looking to get rid of stuff to create more space. The idea that stuff I might otherwise just get rid of or throw away I could actually be able to get paid for is an exciting one, not to mention a little extra motivation to actually stop and procrastinating and begin minimizing my stuff and expanding my space.